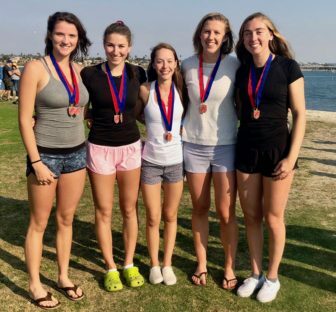 Many of the 14 rowers from the Connecticut Boat Club, including all four from Darien, had gold and silver medals around their necks after they helped earn a spot on the podium for their boats at the San Diego Fall Classic. The Connecticut rowers raced against crews from Calfornia, Oregon, Washington, Arizona, Nevada, Utah and Canada. The same four Darien girls were also on the crew of CBC’s First Varsity 8+, which finished 2nd out of 20 boats to earn a Silver medal. The crew of that boat also included Jacobson, as well as Bridget Galloway of Ridgefield, Ella Petreski of Pound Ridge, Jenna Macrae of Stamford and Kiki Stoker of Pound Ridge, New York. CBC’s 4X also took Silver in its race against 14 other crews. On that boat were Bridget Galloway of Ridgefield, Jenna Macrae of Stamford, Paige Pucel of Ridgefield and Ella Petreski of Pound Ridge. The CBC Second Varsity 4+ boat earned Bronze in their 15-boat race, with crew members Ali Triano (coxswain) of Stamford, Jaia Wingard of Manhattan, Katherine Lynch of Ridgefield, Kiki Stoker of Pound Ridge and Eleanor Imrie of Wilton. Connecticut Boat Club is a high performance female-only youth (middle school and high school) rowing club and Women’s Masters program based on the Norwalk River in Norwalk, Connecticut. Founded in the spring of 2010 by U.S. National Team Junior/CBC head coach Liz Trond, the team includes girls from throughout southwestern Connecticut and Westchester County New York. Not only has CBC proven to be a top-tier program in scholastic rowing, but almost every year a handful of CBC athletes compete for the USA at international events such as the Junior World Championships, where in 2018 Catherine Garrett won Gold in the Youth Women’s 4- and Heidi Jacobson and Julia Abbruzzesee won Bronze in the Youth Women’s 4+. You can learn more by visiting the CBC website and CBC on Facebook. SilverSource Inc., a leader in providing assistance to older adults in need since 1908, will host the 19th Annual SilverSource Charity Golf Outing on Monday, June 10, 2019. — an announcement from SilverSource Tickets are on sale now for this outstanding event, where golfers enjoy a fun day of world-class golf at Rockrimmon Country Club while supporting the SilverSource “Ride to Wellness” and “Housing Stability” programs. Enjoy a high-spirited day networking with fun-loving professionals, friends and family.